This website is not affiliated with or endorsed by the Wisconsin Environmental Initiative or the Green Built Home program. We provide this website as a resource for anyone who may be interested in "green" building. Green Built Home is a national award winning green building initiative that reviews and certifies new homes and remodeling projects that meet sustainable building and energy standards. 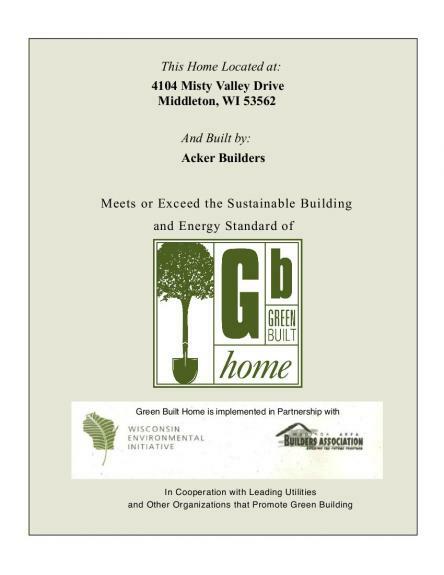 The program is implemented in partnership with the Madison Area Builders Association in cooperation with other participating builders associations, leading utilities and organizations that promote green building. GBH, affiliated with the NAHB National Green Building Program, is also available as a co-branded home certification. So, do you want to build a Green Built Home? Here are our tips for participating in the Green Built Home program. Look over the GBH Checklist to see what sorts of things are on there. Meet with your builder to see what things on the checklist are standard features. You should also participate in the Energy Star home program. If you are still developing contracts, you can get some good ideas for contract language from the Energy Star requirements or the Green Built Home checklist. Don't forget to hire a verifier and submit your green built checklist before groundbreaking. It's worthwhile to get started with an Energy Star consultant and Green Built Home verifier right away. We heartily recommend Laura Paprocki from Trinity Environmental (see our Partners page). Click here to view the Green Built points we are claiming.